Being summer in Europe, it wasn’t particularly the best season to catch waves. But surfing is something we (4 mates road tripping Europe) all love and we couldn’t help ourselves but buy boards, then scratch and grovel for whatever waves we could find. Trekking up the west coast of Portugal it wasn’t looking promising for a good few days, until we eventually became luckier than we could have imagined. Hung over as hell (standard) in Lagos, Portugal, we finally decided to put the partying aside, and get slotted in a few barrels. North of Lagos was our first stop at Ericeira where we made our way to a beach called Coxons. 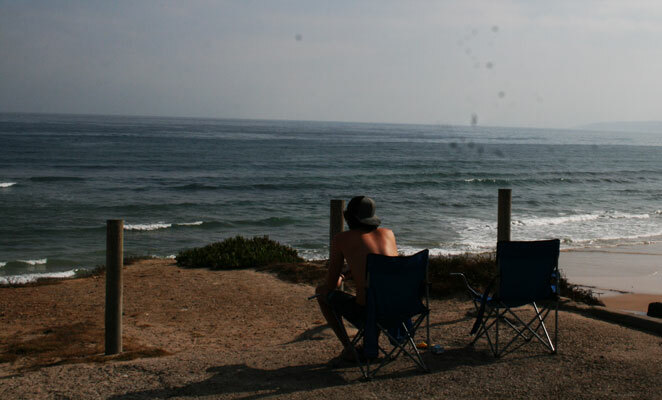 We pulled up in the van and slept anxiously waiting for the morning to arrive and surf. Waking up in disappointment we came to the conclusion that the waves were to small and powerless. Ericeira does get epic waves and we contemplate moving north for swell or to stick it out for a day or two until this place starts to pump. We opted to head to the office (McDonalds) to bum the free Wi-Fi and let the swell charts help in our decision making. Looking at the radar we concluded it would be better to head further north to Peniche. Being the most eastern point of Portugal, Peniche is a swell magnet that would betterour chances of getting waves. Arriving in Peniche the first beach we checked was the famous Supertubos, renowned for its Strady like (Stradbroke, Island in Aus) powerful waves. Yet again we discover disappointment as it’s even flatter than Coxons. We are all now beginning to wonder if buying surfboards was the right decision because our hopesand chances of finding waves were dwindling to an all time low. Another team meeting brought us to a conclusion it would be best to continue onward to Baleal (further north) and see what was on offer. 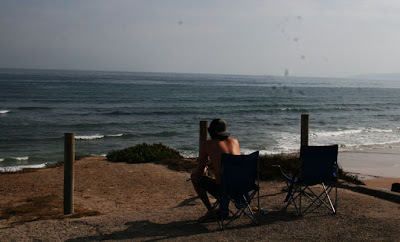 We finally came across surf-able waves but thought it would be best to wait for the correct tide early in the morning. Waking up, smiles gleamed across our faces from the sight of 2-3ft waves. Instantly struggling ourselves into our wetsuits we rushed down the beach and started grovelling for actual rideable waves! At last we got to surf! However, it was super crowded being the only bank breaking on the entire stretch of beach. That and there were so many beginners and kooks (not that we are impressive surfers) dropping in (taking off on the same wave your already surfing), with boards flying everywhere. I think it’s safe to say, just about nobody out in the water even understood surf etiquette, and either that or they simple couldn’t care less. Although we had higher expectations we were still stoked to finally get some waves. Later that same afternoon the swell had picked up a little and it was on again. This time though the crowd was just about unbearable, never before had we seen so many people on one beach, it was actually hard to make it to the water through the crowd! After that session we cooked up a feast and piled into bed. The following morning we had to decide, do we stay and continue surfing here, whilst trying to ignore the crowds or continue on our quest for uncrowded breaks. All agreeing to continue we punched Nazares (home to the biggest wave ever ridden) into the GPS and yet again were let down with zero wavesand beaches so packed we couldn’t even find somewhere to park. Without stopping we kept driving north to find another beach close by to rest up for the evening. Taking a random exit towards the ocean from the highways we stumbled across a place called Paredeswhere there were super fun looking waves and no one out! This was possibly the best decision we could ever have made as we immediately grabbed our boards and started scoring 3ft+ super clean barreling waves. The fact that we were out there by ourselves was one of the greatest feelings and then to have the waves become better as the tide dropped was as though we drove straight into the pearly gates of surf heaven. As the sun went down and our stomachs turned inside out on us from hunger it was time to head in for dinner. However, walking back we noticed fences and a stage being set up. Scoffing another basic dinner of pasta and tuna down we were too intrigued and had to find out about what was happening with the fences and stage. Walking into a shop we were greeted by a English speaking lady who informed us that once every year there is a music festival in Paredes and coincidentally it was being held right below the car park we were sleeping in (in our van we road tripped through Europe with). The festival was only 10 euro each evening so how could we not party it up with the locals of Paredse, Portugal. It was honestly as though we discovered heaven on earth when we drove into a random town not even knowing its existence to find uncrowded, clean barreling waves. Not only that but a 10 Euro music festivalthat is only held once a year and on the exact same day we stroll into town, right below the car park we are camping out in. It simply couldn’t be better!Where in the world has everything aligned to create one awesomely remarkable and memorable experience for you? Wow, I’m amazed all the other beaches were so crowded. Ever since MaCcnamara rode that massive tsunami like wave in Nazare, all eyes are set on Portugal as Europe’s surf capital. Summer here is great for people learning to surf (like me who still falls out of the board basically every time), but during the fall and winter most tourists go home, kids go back to school and the beaches are finally empty. According to what I know, surfers are still friendly here and there’s not many “territory fights” like in other countries, hope Portugal keeps that peace in the water. Come back in the winter time! Yea I know winter is when it’s best, I have been meaning to get back out there for a winter of surf but there is just so much more to see and do. However I will be back!